This page provides you with General Counsel resume samples that you can use for inspiration in writing your own resume, or for creating one through our easy-to-use resume builder. Below you'll find our how-to section that will guide you through each section of a General counsel resume. If you have landed on this page, you surely want to progress on your career. However, to get to the level needed to be an excellent general counsel, there is a special need to acquire a standout resume which should have certain key details that we are ready to provide you with, thanks to the best General Counsel resume sample in the market. VisualCV.com is designed to be a guide to help different people aiming to get to the position of general counsel create very good resumes. We are ready to help you regardless of your knowledge on resume writing: let us get you the dream job you have always dreamt of. As a general counsel, you likely have a specialty such as intellectual property, labor law, or regulatory compliance. You have been responsible for leading corporate strategic and tactical legal initiatives, also providing senior management with strong advice on businesses’ strategies and their implementation. A standout resume will therefore require a good level of technicality and professionalism. The layout of the resume should be professional and it should have matching fonts. Every aspect of the resume should be properly spaced and divided into subsequent. Also, save the document in a PDF format: this is very important as Microsoft Word sometimes changes the layout of your resume. Every resume should have a summary section. This is a special section of the resume which highlights the special parts of the resume. It is the section where you get to sell yourself to the employer. Your summary section is your sales pitch, a brief paragraph or two that tells the employer why you are the best person for this job. Use this section to quickly indicate who you are and why you are enthusiastic about your job! Sell yourself: this is your chance to get to the next level! The work history is a test of the competence of the general counsel. Write your work experience in reverse-chronological order, beginning with your most recent position and working backwards. Write bulleted lists detailing your key accomplishments and successes in each position, using quantifiable details wherever possible. Concrete examples of major initiatives that you spearheaded or negotiations you lead look great on a resume. To consider the tips to write your work experience, look at our resume guide. The right education is integral to anyone practicing law. To the employer, this section is a measure of your competence. To be hired for general counsel positions, you must have your Juris Doctorate and be licensed to practice in your jurisdiction. If you received any academic awards during your studies, they should be included, as well as any important projects or memberships. Your education section should show the degrees you have earned and the names of the institutions you attended. In listing the different parts of this segment, you have to make use the reverse-chronological order. The position of a general counsel requires a particular skills set. Maybe you are oblivious of the different skills needed. We would like to educate you about them. We really like you, so here’s some additional tips for your best business development resume! Say you are good at Microsoft Word! 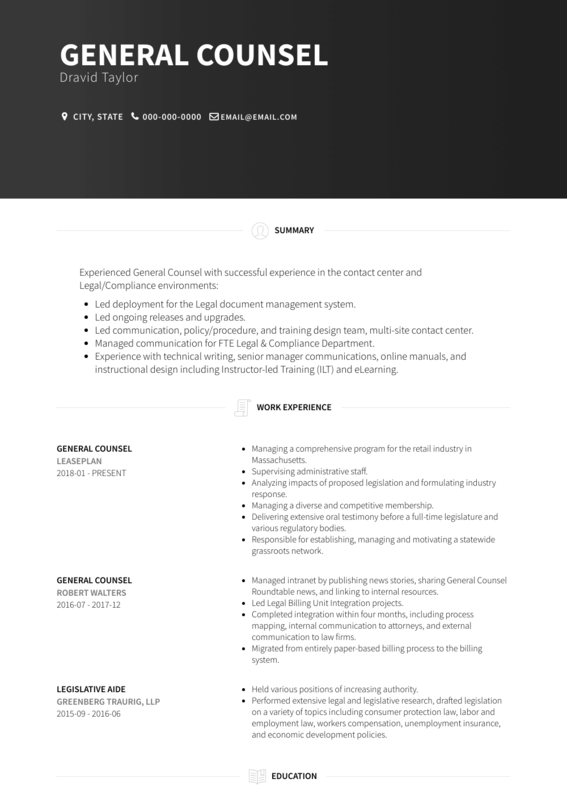 Finally, if you are looking for the best General Counsel resume templates, you should check this masterpiece we have been working on here : many professionals like you have successfully used it to take their career to the next level.